Mermaid prom dresses are all the rage this season and this glamorous Sherri Hill long prom dress will to appeal to your inner trendsetter. Reminiscent of Hollywood celebrity dresses, this off-the-shoulder dress is an alluring and sultry style. With a hip-hugging design, this mermaid prom dress is made from a stretchy jersey fabric that will put your curves on display. 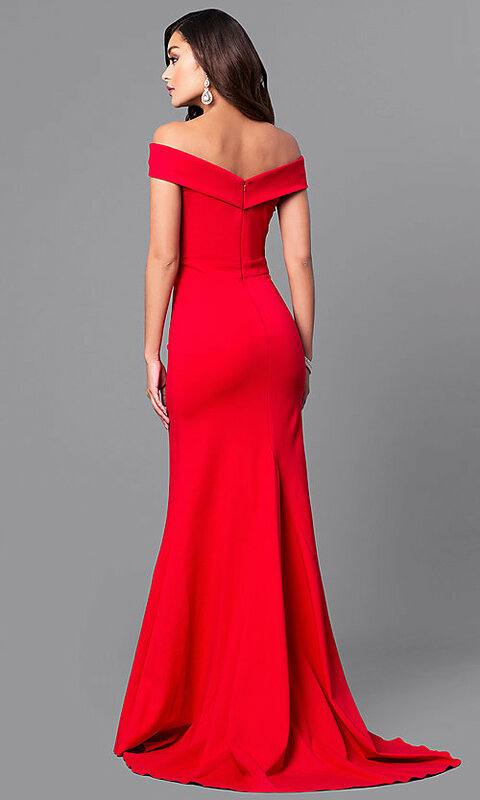 A romantic train gracefully extends from the floor-length fitted skirt on this designer prom dress. A stunning choice for a military ball, pageant or prom, this off-the-shoulder Sherri Hill long dress for prom will captivate and mesmerize your peers at your next formal event.